The SD-WAN market is predicted to exceed $1.1 billion by 2020, according to Gartner. 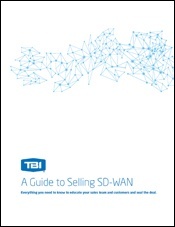 Get everything you need to know about SD-WAN from TBI's free Guide to Selling SD-WAN ebook. Understand key benefits of the solution; challenges and predictions; how to target customers and who the key players are. TBI covers it all in this comprehensive tool kit and even provides you with customizable collateral that you can use with your existing customer base. Get a copy sent to your inbox now! Someone will be in contact with you via phone call within the next 24 hours. While you wait, we think you might find these popular blog posts interesting. SD-WAN and MPLS: It’s a Marriage, Not a Divorce!